Gamestop/EB Games have confirmed an exclusive pre-order bonus for Bungie’s upcoming game Destiny. A Sparrow is a personal vehicle that players can summon on the fly. With this pre-order bonus you’ll get access to an upgraded version right from the start, but these upgrades can be attained through normal gameplay, however the red paint job is exclusive to those who pre-order at Gamestop and EB Games locations. Boost your adventure. 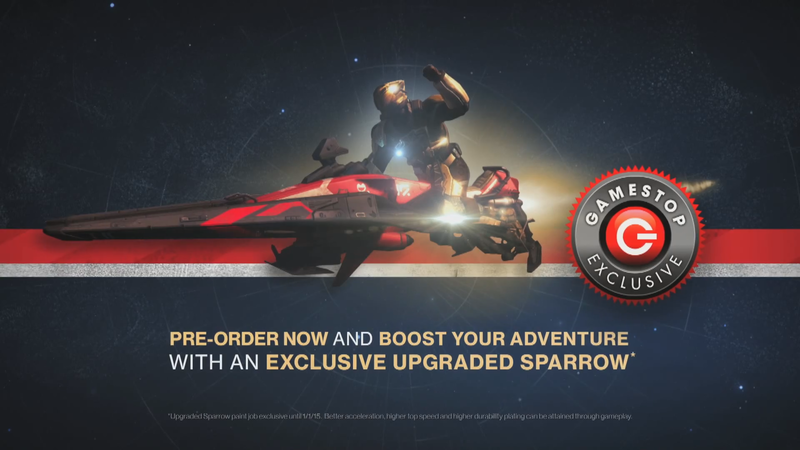 Get an Exclusive Upgraded Red Sparrow with improved acceleration and better top speed when you Pre-order Destiny at GameStop. Power to the Players. Sparrows are rapid deployment vehicles designed to get you where you need to go at breakneck speed. Along with the custom paintjob, this exclusive, prototype version features upgraded initial acceleration and higher top speed than the standard model. To compensate for the boost, the hull has also been fitted with enhanced armor plating. *Upgraded Sparrow paint job exclusively available to those that pre-order until 1/1/15. Sparrows with better acceleration, higher top speed and higher durability plating can also be attained through gameplay. This entry was posted in Destiny 1 and tagged Bungie, Destiny, Destiny Pre-Order Bonus, Destiny Shrike, Destiny Sparrow, EB Games, Gamestop, gaming, video games by Chief Canuck. Bookmark the permalink.